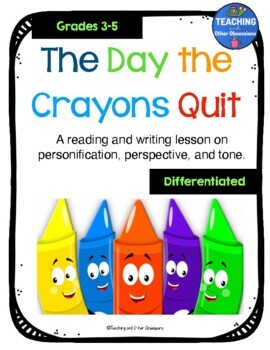 The Day the Crayons Quit by Drew Daywalt is a great mentor text for teaching perspective and tone in the upper elementary grades. This lesson provides materials to review or teach these skills. 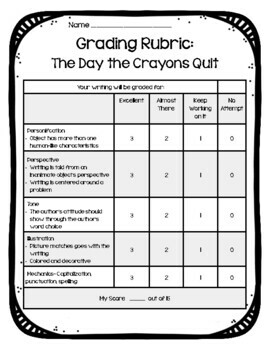 Students will be making notes of the different ways the crayons have been given human characteristics. In addition, they will chart the tone of the letters and provide text evidence to support their thinking. 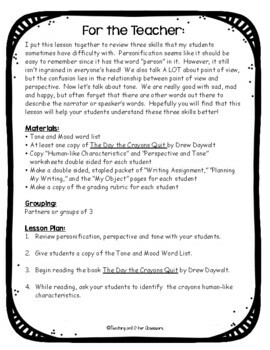 To connect with the reading lesson, students will then write their own short stories, letters or newspaper articles bringing to life an inanimate object. They must identify a problem the character has, then write about it from the character's perspective. They will select a tone the character would use and write in that tone. 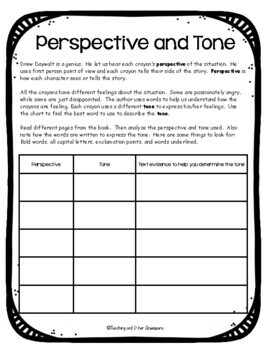 After completing this reading and writing lesson, students will never be confused about perspective and tone again!